The use of small microcontrollers like 8051, Cortex M0 or PIC16 is widespread in many electronic devices. Powering these devices is relatively straightforward, but in industrial environments or other applications using higher input supply voltages, there are different methods for stepping down the input supply to the 3.3V low current supply. Efficiency, output ripple, footprint and cost can be important decision factors for choosing a suitable power supply solution. This application note provides some solutions using Richtek ICs for powering these devices from (industrial) 24V supply rails. Many applications use small microcontrollers for I/O control or communication. The supply requirements for these microcontrollers are normally around 3.3V with current ranging from 5 ~ 50mA, depending on peripheral I/O blocks. For selecting the right power management topology, the designer has to consider efficiency, output ripple, footprint and cost. The simplest way to step down voltage is using a linear voltage regulator. In many cases this is a good solution if load current is low and efficiency is not important. But when the difference between Input and output voltage becomes higher, the regulator dissipation can still become a critical factor at slightly higher load currents. In industrial environments, input voltage fluctuations may occur, so the regulator input range must be sufficient to handle these fluctuations. Below table shows various Richtek linear regulators that can be used for powering MCUs from 24V rails. The amount of load current that can be supplied mainly depends on the thermal limitation of the package. The power dissipation figures below are practical values that are valid in normal PCB layout with some extra copper to the ground pins of device. 3.3V is a common output voltage, but different voltages are available. The circuits for these linear regulators are extremely simple and ceramic capacitors as small as 1μF can be used. Figure 1 shows some application examples. 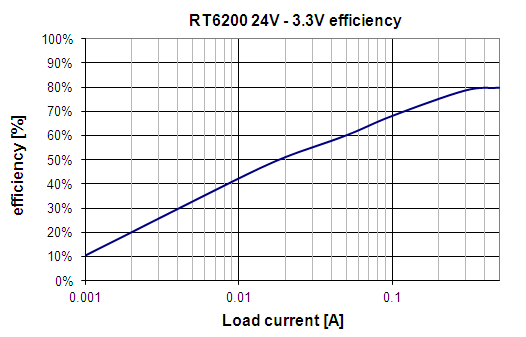 The RT9058 and RT9069 have the advantage that at zero load, the regulator consumes almost zero power due to their very low quiescent current of only 2μA. This makes them suitable to be used with battery inputs as well. To achieve higher efficiency, a switching step-down regulator must be used. Because of the low load currents in microprocessor supplies, the switching losses of the converter play a larger role in the total efficiency than the MOSFET conduction losses. Reducing frequency will reduce switching losses, but pulse skipping modes sometimes have higher output voltage ripple due to the discontinuous conduction with fixed peak current operation in this mode. 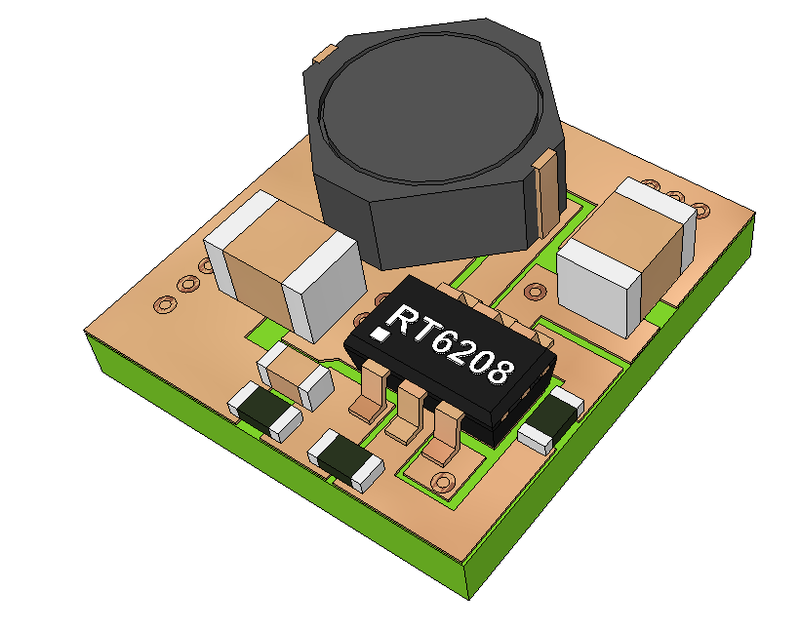 The RT6200GE is a low current asynchronous buck converter with 36V input rating and 1.2MHz switching frequency. The SOT23-6 package achieves small application footprint, while the high switching frequency allows the use of relatively small inductors and output capacitors, and reduces output ripple. Block diagram and basic schematic are shown in figure 2. In light load operation, this converter works in discontinuous mode, and the high-side MOSFET will occasionally skip pulses, to keep output regulated. An internal low-side MOSFET recharges the bootstrap capacitor. Small external Schottky diodes can be used and these devices switch fast and have low voltage drop at low current levels. This operation achieves good efficiency over wide input and output voltage ranges. Figure 3 below shows the complete application circuit for providing a stable 3.3V from higher input voltages. The circuit is designed for load currents up to 0.5A, and uses only a few external components. At 0.5A loads, the converter works at 1.2MHz continuous conduction mode. Inductor Current ripple is calculated by : Ripple is normally set at 0.4*I-max. Also for low current designs, it is recommended to keep the current ripple around 0.4*device max rated current. A 10μH inductor will give 238mApp current ripple. This means that the converter will enter discontinuous mode at load currents lower than 119mA. At light loads, below 75mA, the converter starts to work in pulse skip mode with fixed peak current of around 200mA. In this design, the inductor is a small 4x4x1.2mm type, with saturation current of 700mA. For load currents below 100mA, a smaller type with ~350mA saturation current could be used. The output capacitor determines the output ripple. The 10μF/16V 0805 size MLCC has around 7.7μF capacitance at 3.3V due to DC bias effect. In pulse skip mode, the output voltage ripple will increase to around 22mVpp. The RT6200 has internal compensation, but since the error amplifier is a normal OPAMP type, the bandwidth of the converter can be modified by changing value of the upper feedback resistor R1. The compensator gain (400kΩ/R1) is normally set at 12dB for typical applications that use 10μF output capacitance, resulting in a bandwidth of around 70kHz. When using lower value output capacitance, the converter bandwidth will increase. In order to keep sufficient phase margin, the value of R1 needs to be increased. To make this design less sensitive to noise, the bandwidth has been set slightly lower to 55kHz and phase margin is 58 degrees. For automatic start-up, the EN pin can be left floating.. Figure 4 below shows the output voltage, switching waveform and inductor current at 10mA and 20mA load condition. In both cases, the converter works in pulse skip mode. The small internal low-side MOSFET will activate during every clock cycle to re-charge the bootstrap capacitor, and this results in some extra ring pulses between the high-side MOSFET switch cycles. The efficiency of this application is shown in figure 5. In the 50mA range, the efficiency is around 60%. SoC parts with RF sections like Zigbee Light Link and Bluetooth Low Energy have current consumption around 5 ~ 50mA. These SoC are often built into lighting applications that run from higher voltage supply rails and need to achieve very low total system standby power. They therefore need to achieve the highest possible efficiency in the low current ranges. 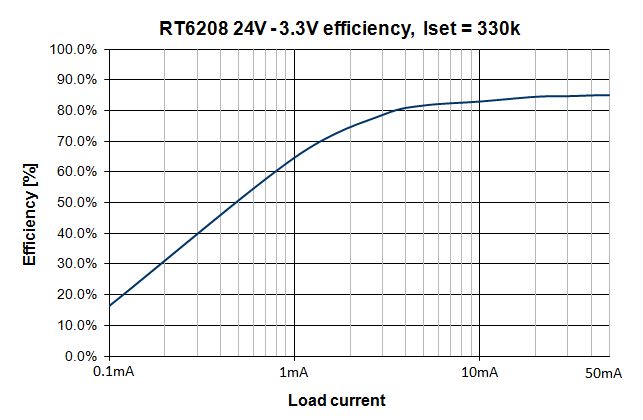 RT6208 was specially designed for these types of applications, and minimizes converter losses by a special boundary conduction mode / low quiescent current sleep mode cycling operation. The RT6208 Block diagram and basic schematic are show in figure 7. The operation mode of RT6208 works as following: The external resistor on the ISET pin sets an internal maximum peak current limit. The feedback comparator has an 800mV reference and a 5mV hysteresis. When the feedback signal on FB pin is 5mV lower than the internal reference, the internal high-side MOSFET is switched on and inductor current begins to ramp up. When the inductor current exceeds the internal peak current limit, the high-side MOSFET is switched off and the low-side MOSFET is switched on. The inductor current ramps down to zero. This triangular current pulse charges the output capacitor, and the FB pin rises above the 800mV reference. After the inductor current reaches zero, both MOSFETs are switched off and the converter is switched into a low quiescent current sleep mode. The output voltage slowly discharges by the load current and when the FB voltage drops 5mV below the reference, the high-side MOSFET is activated again and the cycle repeats. In case of larger output capacitors or low current limit settings, the converter will generate multiple switch cycles in boundary conduction mode until the feedback pin exceeds the reference. This operation minimizes switching losses, and achieves very good efficiency in light load range. Figure 8 below shows an application circuit for a for a 3.3V 50mA supply with high efficiency at low current. This value sets the reference for the internal peak current sense comparator. In practice, the actual peak current will be higher due to the peak current level comparator propagation delay of ~100nsec. This increase in peak current due to propagation delay depends on the dI/dt of the rising current slope, which is dependent on Vin, Vout and L value. So high Vin applications with relatively small inductors will show higher peak current than the programmed value. Recommended inductor values for RT6208 3.3V and 5V applications range from 47 ~ 150µH. Larger inductor values reduce dI/dt, so application peak current will be closer to the programmed value. Lower inductor values will result in higher peak currents than programmed, but this does not impact overall performance. Saturation current should be selected higher than the maximum application peak current. In these low power applications, inductor core losses play an important part in overall losses, and higher quality shielded inductors will have less core losses than open semi-shielded types, thus improving efficiency. This capacitor value will result in 1% output voltage ripple. In the 3.3V example application using a 47µH inductor, a 106mA programmed current will give around 200mA actual peak current at 24V input. The calculated output capacitor value needs to be 8.6µF. A suitable choice is Murata GRM21BR60J226ME39 22µF/6.3V 0805 which has around 9uF capacitance at 3.3V due to DC bias and AC ripple effect. To improve the switching stability of the hysteretic mode converter, a small feed-forward capacitor Cff can be added in parallel with the upper feedback resistor. This example uses 100pF. For automatic start-up, the EN pin can be left floating. Figure 9 below shows the output voltage, switching waveform and inductor current at 5mA and 50mA load condition with different input voltages. It can be seen that the inductor peak current increases with higher input voltages due to comparator propagation delay. At 24V, one current pulse is sufficient to produce an output ripple which can exceed the FB hysteresis. At 12V and higher loads, two consecutive pulses are needed to exceed the FB hysteresis. 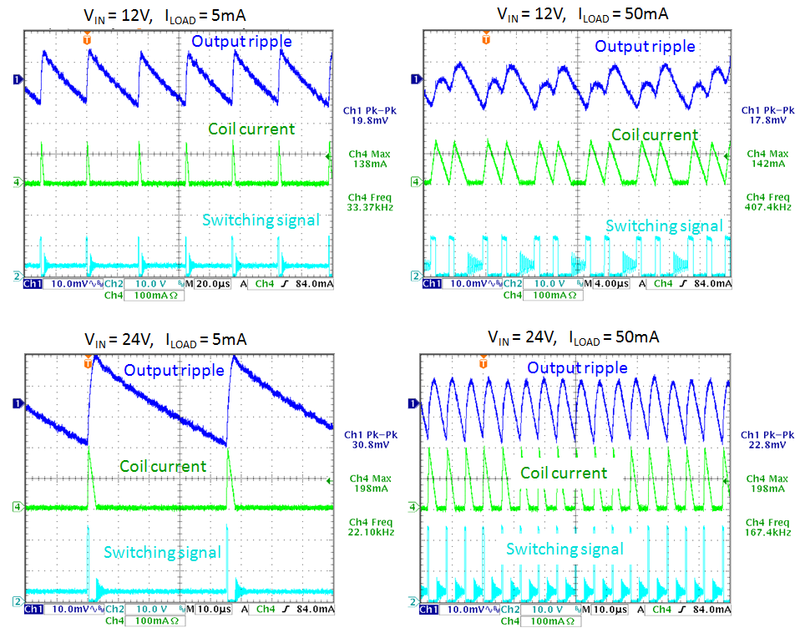 The efficiency of the 24V – 3.3V / 50mA application is shown in figure 10. In the 5 ~ 50mA range, the efficiency is more than 80%, which helps to meet low power standby requirements. An example layout is shown in figure 11. The power section is placed at the left top corner, and several vias connect power ground to IC ground (underneath the IC) via the inner ground layer. The feedback pin is sensitive to noise pick-up, and the R1/R2 network should be placed close to this pin, away from noisy signals. The ISET resistor is connected to the same small signal ground as the feedback resistors. Total footprint of this layout is 7.5 x 8mm. In this application note two different methods are described to power microcontrollers from 24Vinput voltage supplies: Linear regulators like RT9058, RT9069, RT9068 and RT9074 can be used when load current is small, up to 38mA depending on package. For better efficiency and higher current levels, Buck converters like RT6200 and RT6208 can be used. 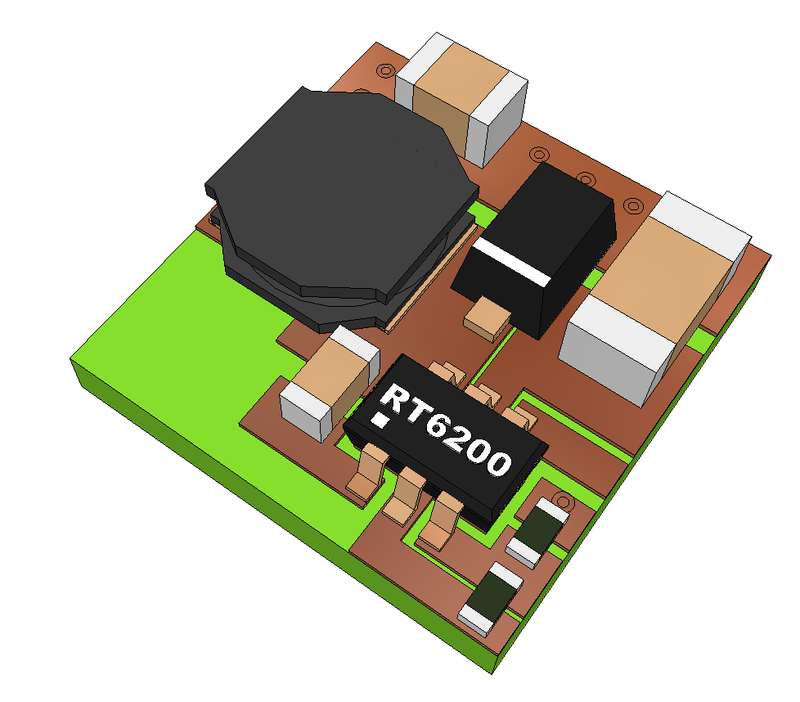 RT6208 is especially suitable for applications that require high efficiency at light loads.